I got on a “night here, morning there” call with James Clark of Nomadic Notes recently. James is a digital nomad working from Ho Chi Minh City—Saigon—in Vietnam. He’s not there all the time, but for long enough stretches to get a feel for what it costs to live there. 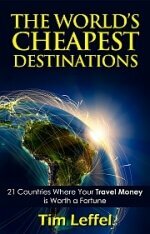 I’m starting to compile info for a book I have coming out next year on cutting your expenses in half by moving abroad. You don’t have to necessarily move to one of the cheapest places to live in order to do that, but Vietnam certainly is one of the cheapest places to live or travel. Here are some highlights of our conversation, with the inside scoop on day to day living expenses in HCMC. How did you get yourself into a position where you can travel and support yourself from the road? I found that I liked traveling a lot once I started and liked working on the internet, so I figured out a way to work for myself and keep doing both. For the last ten years I’ve been doing web design while traveling, working from various places around the world. I’m from Australia, but I haven’t had an address there since 2010. I’ve mostly been in Southeast Asia. I’ve been living in Vietnam most of the past year, in Ho Chi Minh City. I tried out a lot of places on for size for while traveling, using different spots as a base. I knew a friend who lived here and liked it, plus there were some other online friends I knew were based here. So it was easy to move here and make this my new home. I work during the day at cafes [thus a hefty $5 a day coffee budget] and there are probably 15 people I know here who are working online, on businesses. It’s nice to have people to go out with and bounce ideas off of. What is the visa situation for living in Vietnam? When you fly in you can get a one month visa on arrival or a three month one you apply for online before you come. I have a multi-entry visa. Some friends have business visas, but that’s more complicated to get and you usually need to be employing people or you are sponsored by a company. I have to leave the country periodically and return to start a new three-month cycle. What is it like setting up a rental there? The first place I rented was just a room in a house for $250 a month, but you can get your own private furnished one-bedroom apartment in District 1 where I am for $500 that will be decent. That includes a maid who comes three times a week and does your laundry. All of them include internet. Electricity is never included, which is $20 a month or so, more if you have the air conditioning running all the time. Every time I’ve returned, I’ve found a place within one day for a short-term rental. I’ll book a guesthouse room for one night and the next day I’ve found a place. What do you spend on a monthly basis? I did a detailed blog post noting my expenses for one month and that was less than $800, living rather frugally. You could spend more on an apartment and go out more, but still, for $1,000 you can live quite well here. It’s so cheap to eat great food there, I assume that’s not a whole lot out of your budget. You can get a lot of great international food here, but the street food is excellent. A filling bowl of pho will set you back about $2, half that outside the central district. Is there anything that costs more than you expected or is a poor value? The shopping is not so good here compared to somewhere like Bangkok if you want to buy clothes or something. You wouldn’t buy electronics here because the taxes are really high on top of higher prices to begin with. So if my Macbook dies, I’m not replacing it here, that’s for sure. Still, there a lot of people that walk around with iPhones here, which is really surprising! Rent a scooter for $60-$80 a month and join the locals in the choreographed mayhem. I assume your okay with the tropical heat? I’m used to heat and sometimes it’s hotter in Australia where I’m from. I spent three winters in the northern hemisphere and that was enough for me. I enjoy the heat. Have you had any trouble with internet censorship or site blocking? Here it’s really easy to get around, not like China. The blocking here is much lazier. You can change the DNS in your IP setting and bypass everything. If you haven’t done that, most of the cafes have already bypassed the blocking anyway. How do you support yourself on the road. It’s not through Nomadic Notes, right? I already had my business running before I ever started the travel blog, so there was never any pressure to monetize it. I’ve put some different ads on it now and then to experiment, but it’s never been enough to really make a difference. Thankfully I don’t have to use it to generate my income. I get that from a combination of web design, SEO work, affiliate marketing, The job and my income streams have changed considerably over the years. I have to keep up on it and I feel like if I went away for a month and didn’t pay attention I would have a huge amount of catching up to do and it would be really daunting. What advice would you give people who want to become a digital nomad and work from the road? It doesn’t take nearly as much preparation as people think. Often the barriers are an excuse to not get started. Everything you need is everywhere these days; it’s just a matter of getting on a plane and going. If you already have a job where you can work online or do your job remotely, it’s not a big step. You can always do some trial runs for a month or two—it doesn’t have to be a full-time thing. Do it part-time. For me it was nice to go back to Melbourne for a while, then after a few months go somewhere else again. Is there a limit to you long you feel you can travel non-stop before needing to settle down for a bit? Maybe it’s because I’m getting older, but I do definitely need to stop and work out of one place for a while. I had a bout recently of nearly two months of solid travel and that wasn’t ideal. For me a month in a row is about the maximum. Find travel and living abroad posts from James Clark at NomadicNotes.com and on Twitter @NomadicNotes. There’s also a Facebook page by the same name. Since I haven’t been to Saigon for ages, all photos here are courtesy of James. No scraping! I love the coffee in Saigon so I’d definiately have to have a large budget for that! AGREED! I was on a caffeine binge my whole trip. I love that black ice coffee chased with Viet ice tea! This was a really interesting read! I love how you cover the details you won’t find in a travel brochure like censorship on the internet and budgeting groceries. Have you checked out http://realfamilytrips.com yet? Travelers share their itineraries with others so they can help each other narrow down the destinations best for them. I’m sure quite a few of your trips would make great itineraries! Thanks for the great detail in this post. It made me a bit more open minded to a destination like this. Ask around with the foreigners after arrival and you’ll find plenty available. Move in a day or two later. Did you factor in all the scams and double pricing? Scam city. I had fun in Saigon but Vietnam it’s a tough place to live. It ain’t Thailand or Cambodia that’s for sure… You need to stay sharp or loose your sh*t.
is there anywhere like this you can recommend? If you want to rent a studio or apartment, you can go to http://vietnam.craigslist.org/search/roo or http://www.expat-blog.com/en/housing/asia/vietnam/ho-chi-minh-city/. There are a lot of housing posts there. An looking to come and live in vietnam, over 60 but i am very fit dont drink or smoke,looking for the good life,laughing and jokeing etc over nz with its cold weather.i suppose you would find something to do work wise part time.food sounds cheap as does apartments in ho chi min,id like a comment on that if poss.thanks Gary.